Announcing my very first public art show at the Audacity and Cafe in Yreka, CA, Friday December 2nd 2011, from around 4:00 PM to around 9:00 PM or so. I will be presenting a variety of framed and matted prints, as well as plain prints and greeting cards of the art you can see in my galleries and on this blog. There will be something for every price range. This event will be held in conjunction with the Yreka Arts Walk and Night of Lights, a festive downtown celebration. Stop on into the Audacity to enjoy a warm beverage and good company, check out the art, and talk with the artist. 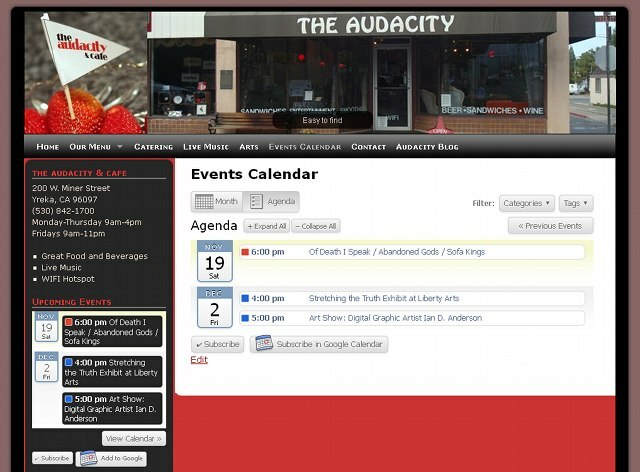 I am proud to announce the creation of a new web site for the Audacity and Cafe in Yreka, California. Implemented in WordPress, this site is not so much about my designs as about putting the customer in charge of content and allowing timely updates. The Audacity is Yreka’s cultural hotspot featuring good food, live music, catering, parties, arts, culture, and a friendly atmosphere, all right off I-5 in far Northern California just past mighty Mount Shasta. It has been great working with the Audacity people and getting to know the scene. The photos you’ll see on this site are not the result of slick professional photography, but are candid snapshots of real people having actual good times dining, dancing, listening, and enjoying life in the Audacity, an authentic reflection of the experience you will have if you drop on by during your travels or show up for an event. New, enhanced image in my art gallery: Secrets whispered on the wind can be blown far away and captured again to speak in our dreams. Likewise, virtual conjurations can enter the dream realms and so affect reality. This image is about living on the land in tune with nature and the mysteries. 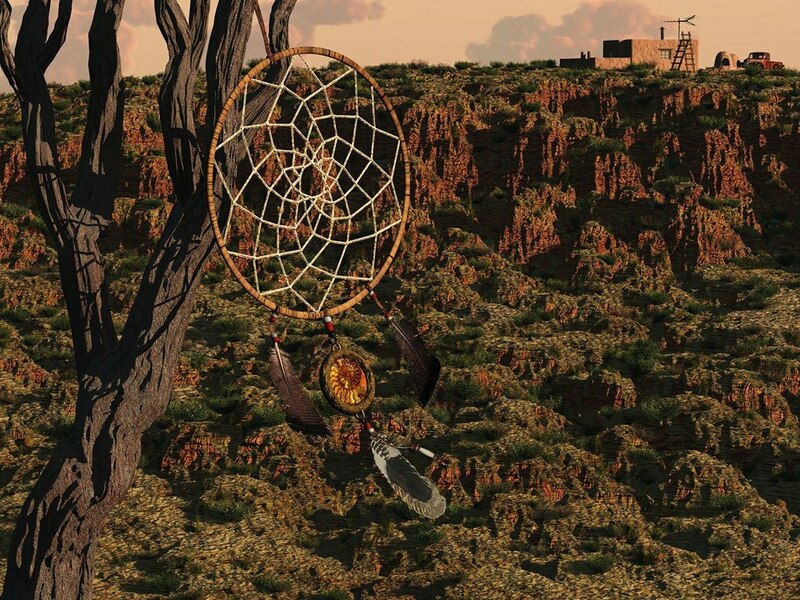 The land looms large, the dream catcher and the clouds loom large, and the accommodations of human life and civilization are tucked into a corner, adequate and unpretentious. There is an implied wind that fills the spaces of this composition and carries dreams to be captured by the various antennae present. This new render brings the image resolution up to 480o pixels and features richer, deeper colors than my previous upload. This Vue 3D digital art project had to be rendered in 49 separate sections, and pieced together with some retouch to conjure this virtual Southwestern desert landscape. My 3D digital painting ‘Solar Flight’ has finally been rendered and improved to the point of being ready for print in larger formats. Much effort had to go into optimizing this 3d art project to get it to render suitably large and to bring out the colors I wanted. For a long time it had looked like I might never render this image large enough to print much bigger than a postcard, but persistence has paid off. 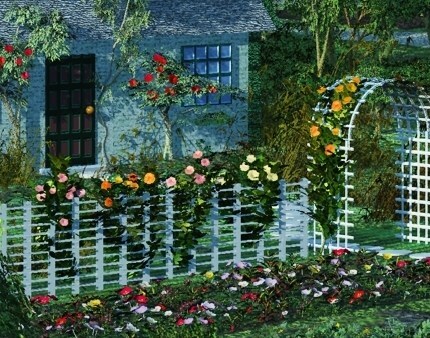 The result is an exquisitely detailed image that has much to reward the eye. The time I spent detailing and polishing this scene finally shows through. 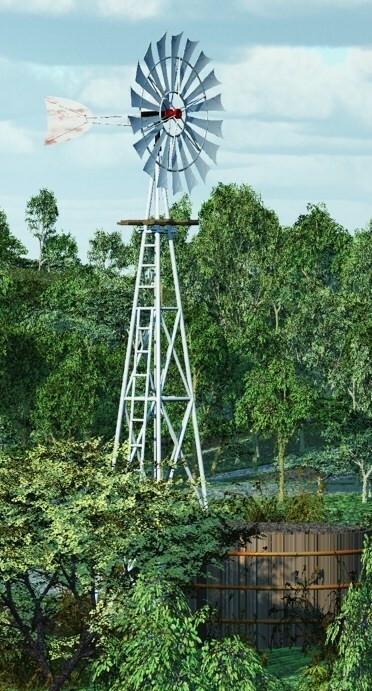 The vision is of a gentle permacultural landscape, intensively cared for, producing both food and flowers in a peaceful world no longer dominated by petroleum powered engines and their attendant infrastructure. Is this a possible future or a pleasing illusion? Can a world without gasoline become a better world? If it could be, is there a way to get there from here? 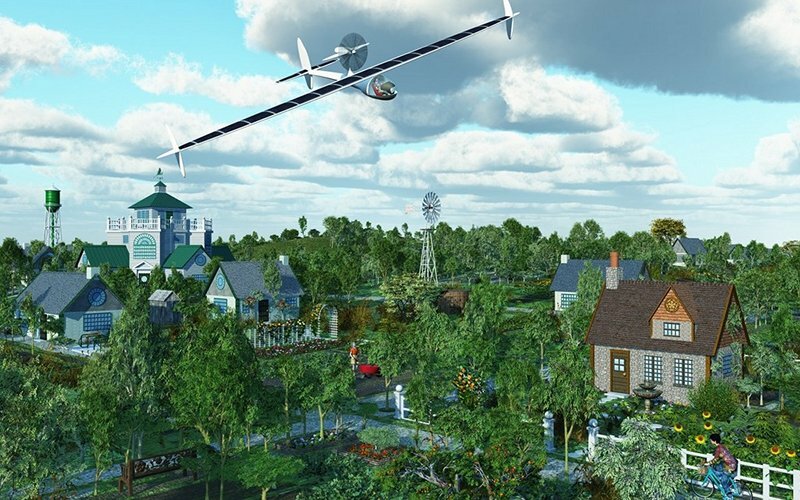 Could such a de-industrial world give rise to that complicated solar assist glider seen soaring over the scene? Or is this after all just a pretty picture to enjoy without worrying? The artist only raises questions without necessarily answering them. 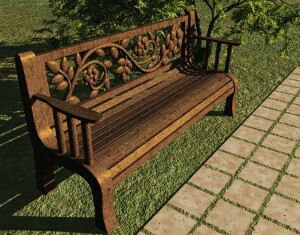 It was a lot of fun building this virtual 3D world in E-on software Vue and planting little virtual gardens all around. This is a fully realized 3D model that can be walked or flown through, and I am intending to render more virtual camera takes of it, with a bit of rearrangement and detailing to suit each shot, to make some more nice pictures of this scene now that I’ve put so much time into it. For close ups, I’ll be deleting much that’s off camera to spare my overtaxed computer that was stretched to the max producing this image. 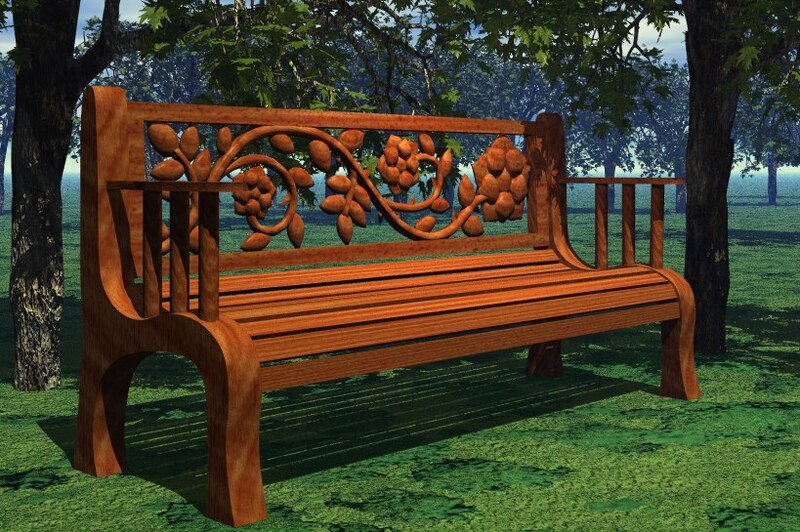 As a final improvement to a scene in progress, I removed a free downloaded 3D park bench model, and replaced it with one of my own design. This adds a nice touch to the rose theme I’ve been weaving throughout the image. 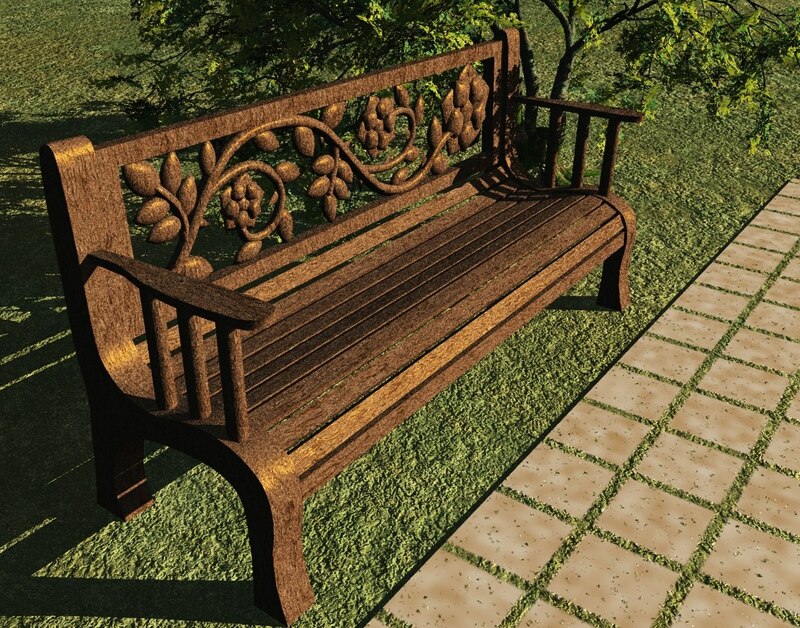 I am making several versions of this virtual park bench available for free on my free 3D models page, a Bryce OBJ file, a Vue VOB file, and a generic OBJ file that will render anywhere, though you’ll have to provide your own material for the OBJ. Feel free to see what it looks like in shiny chrome or pitted kryptonite if you’re so inclined. Since this model was designed for inclusion in a busy scene where I am working to minimize memory use, it is designed to be easy on your computer’s memory, using a minimum of vertices without losing detail, using simple procedural wood grain textures for Bryce and Vue, and staying away from memory eating bitmap textures. This starts when I found what seemed like just the right WordPress event calendar plugin, all-in-one Event-calendar, with lots of good features, useful shortcodes etc. However, like many event plugins, it uses a custom post type, and normally will not show up in blog postings. My client wants scheduled events to show up in the blog home, and lists by category or tag as well. Say, clicking “Live Music” should bring up videos and photo albums of past performances and scheduled future event info. Finding out how to add the custom post type was not too hard, but the events use their own custom “taxonomy” as well, their own kind of category and tag that aren’t really the category and tag of regular posts. I really wanted to solve this problem, not just for this specific plugin, but for any custom post types and taxonomies I run into in the future as well. This has led me through some murky sketchily documented regions of the WordPress world around custom taxonomies and query modification, to at last arrive at this piece of code that can be placed in any theme’s functions.php file, and will cause ai1ec_event type custom posts to be displayed in blog home, feeds, and lists by category or tag. This uses the very handy pre_get_posts action hook which can change which posts are displayed without having to change anything else about the blog, thus keeping the code nice and portable. This can be modified to query across any set of custom post types or taxonomies. I believe this is just the tip of the iceberg for WordPress multiple taxonomy aggregation and taxonomy mapping that will start to occur as custom post types and taxonomies continue to multiply like free plugins and spread through the WordPress ecosystem. We who wish to control what material site visitors and subscribers will have promoted to them regardless of what WordPress has it filed under would like to be able to invisibly and seamlessly assemble that material behind the scenes. The existing custom post type and taxonomy plugins for WordPress seem to emphasize creating and managing your own set of custom posts, tags and fields, but there seems to be little for managing and presenting the exploding array of custom types being introduced as more and more plugins take advantage of custom post types and taxonomies. A plugin to generate functionality like the above from checkboxes for every post type and taxonomy in the database and a menu of page types would be a handy thing. Plugins that depend on a visitor to navigate taxonomies in a sidebar widget are a waste of time. There’s no reason for a site visitor to think anything more complicated than clicking a menu or category is going on, and this functionality is too useful to restrict to a widget. My gallery image ‘Tulgey Wood’ has been upgraded with an improved render to 3600 pixels and a new detailing effort to bring the image to a better level yet. Here are some virtual chanterelle mushrooms in a detail from this image. These are 3D mesh model mushrooms, each one having its own little virtual light source and being made slightly translucent. Yes, there is a jabberwocky in this tulgey wood, or is that just the shadows of the branches and a strategically placed lichen? Do I hear whiffling and burbling somewhere among the trees? OK, so I did slightly enhance the jabberwocky on the higher resolution render, but it was mostly there to begin with in the interplay of virtual light and shadow. At the far end of the Hyadean wormhole the laws of physics are a little different, and Earthly mortals who venture there risk their sanity. The towers of lost Carcosa loom beside the lake, left behind by some forgotten highly alien beings. The dread presence of Hastur awaits, and only those who desperately desire total transformation at any cost dare drink from this lake. Lake Hali was invented by Robert W. Chambers using names from Ambrose Bierce, and the myths of Hali, Carcosa, and Hastur have been extended and embellished by H. P. Lovecraft and his fans and followers ever since. 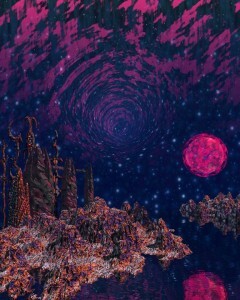 This project started out long ago as an experiment with using a Bryce terrain as a sky backdrop and morphed from there. The project has continued to reside on my old Mac G3, which has rendered it to 4000 pixels across in one afternoon without complaint, before I ported it to a more modern computer for retouch. The effects simply have never looked the same in any other render environment. This contrasts favorably with some more modern 3D software I’ve been dealing with that moans about insufficient system resources and goes catatonic at render time despite several orders of magnitude more processing power and memory available, even when I’m only asking for less than 3000 pixels. I’m afraid software code inefficiency is growing even faster than Moore’s law. This old Mac comes equipped with a 0.3 Ghz single core and 0.192 GB of RAM for goodness sake! Once every old art project I want to extract has been rendered to maximum size, it will finally be retired with honors. So far, rendering each project at the maximum allowed size has only been a matter of time, never a question of whether the old computer could do it. Hats off to Steve Jobs for creating an amazingly stable and useful computer for its time, one that changed my life when it first arrived on my desktop. 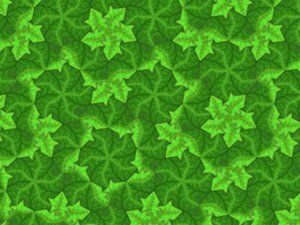 The leaf tile pattern posted under ‘Decorative Penrose Tiles’ is now available as a card or print. The image has been retouched and cleaned up considerably from what was posted in low resolution back in December, and is now ready to make prints. This piece has now been given the more artistically descriptive title ‘Infinite Interleaving’. It is a piece that brings together mathematical precision and aesthetic beauty in an intriguing way. 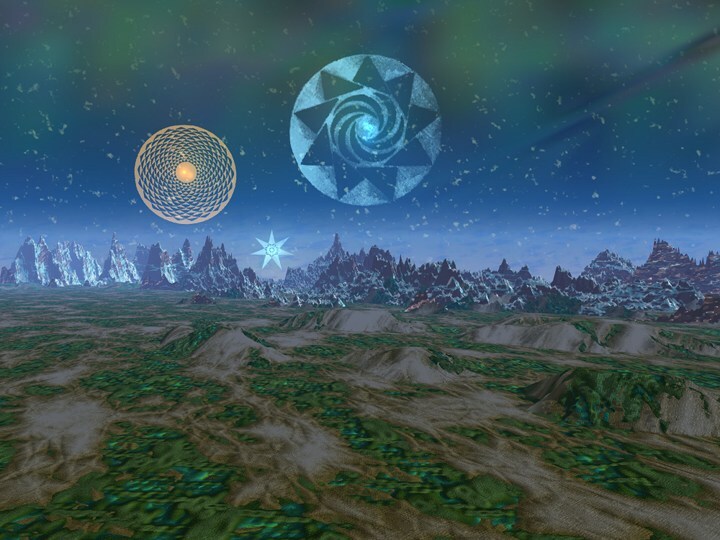 This image, entitled ‘Tralfamadore’ depicts an alien landscape with crop circle mandalas floating in the sky, a place where spacetime itself is bent differently. This is a place so far from Earth that whatever shines up in that sky doesn’t even look like stars, maybe some sort of scattered galaxies, or perhaps what stars look like to four dimensional beings. In the foreground, something like agriculture may be taking place. Are there creatures living there who stare in wonder at the patterns impressed upon their crops by unknown minds from far away? 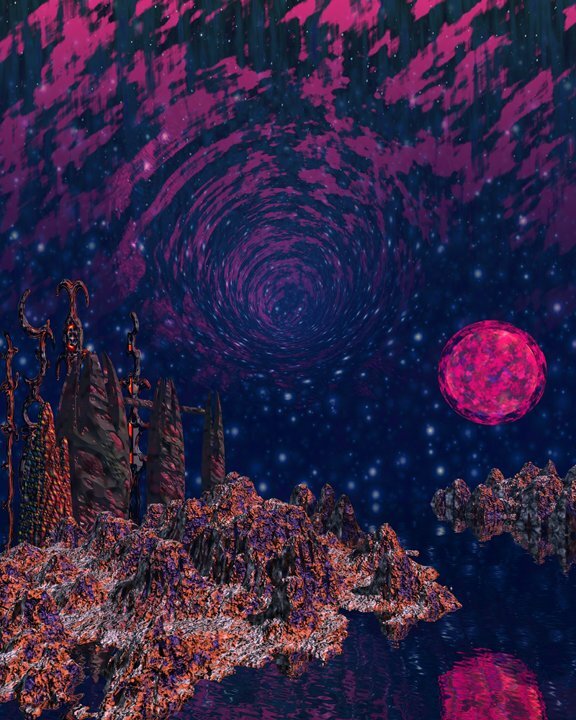 The sky in this scene is actually a big Bryce cube in the background coated with a procedural texture. This is one of those times when Bryce’s procedural texture generator came up with the right magic early on and it was then a matter of tweaking the parameters to get it just so, with delicate twilit haze and auroras worked in by tweaking filter settings. The terrain texture took a bit more deliberate planning and choosing of blending, frequency, and coloration to get things painted in to my satisfaction. Much of the surface of this image is covered with just these two Bryce procedural textures, so some fussing with them was in order. For a sampling of what I and other 3D digital graphic artists have created, see the 3d digital art gallery at Fine Art America. 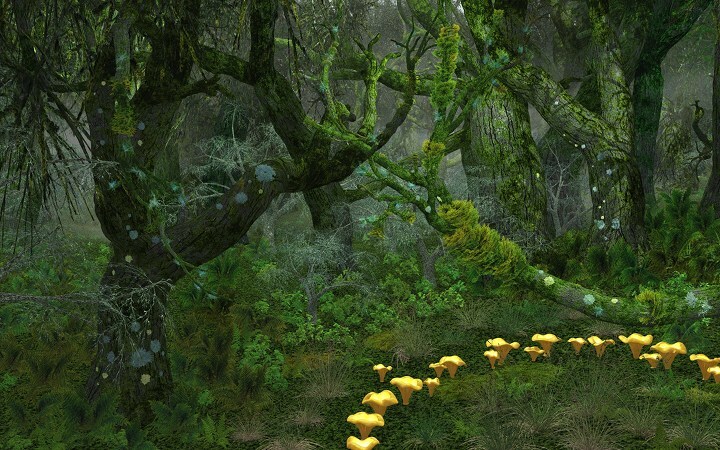 This luscious inner forest scene is a composite of different forests I’ve seen in my wanderings among the coast ranges of California and Oregon during the rainy season. On the soggiest, foggiest days every tendril of lichen, moss, and fern is stretched out to soak in all it can, and the forest breaths deeply, a phase of the life of the woods few humans venture out to experience. Indeed, these delicate, spongy lands are best off seldom visited by humans, and it is enough for me to know that they are still out there unmolested. The word “tulgey,” as applied to a forest, has meant more to me than just the “dark, thick, or scary” suggested by online dictionaries, but also ragged, shaggy, mossy, lichenous, wild, and filled with life upon life in every crevice. This is the sort of quality that accrues to forests so deep and wild that they may yet harbor such rare and elusive creatures as jabberwocky or sasquatch. This coastal western forest scene was rendered with Vue 7 and uses extensively customized plant species to complete this ecosystem including fescue (bunchgrass), fern moss, rock fern, and several lichen species. 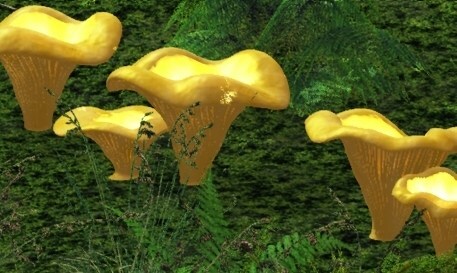 The virtual chanterelle mushrooms were modelled in full 3D, making one improbably perfect chanterelle with a mesh editor, and using Poser deformers to warp it into more natural shapes from there. Yes, I have seen partial fairy rings of chanterelles, and there are pictures on the web of others. Chanterelles are prized for their gourmet tastiness, and their hidden haunts are kept secret by those in the know. 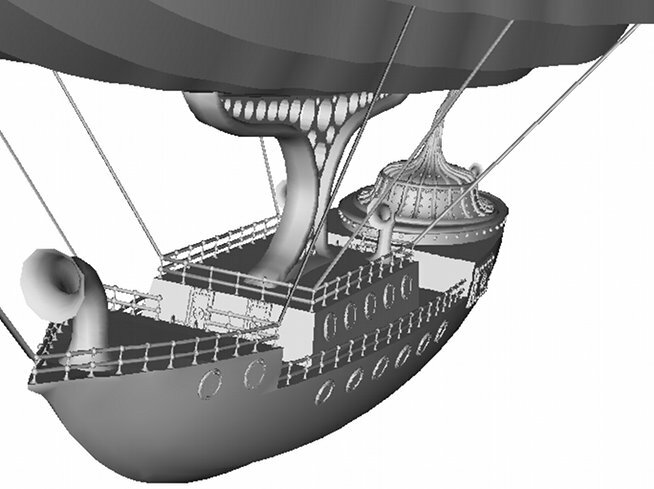 I have created this steam driven virtual dirigible for use in my 3D art scenes. I am hoping to get a decent export of it to a generic 3D object format so it can be made more widely available. The render above is done with Vue. The paisley dirigible skin lends a whimsical touch to the piece, though it could certainly be skinned many other ways. Below is the plain 3D model, unskinned, with no procedurally mapped bumps, just the ones that are actually modeled. Below, I have a little fun with colors. It becomes easier to see which wyrm is which and how the rubber stamp pattern repeats and interlocks. This leaf border is based on a pattern from the Kelmscott Chaucer and is suitable to use as a WordPress header image for most common WordPress themes. It is free to download and use anywhere. The image above is 1024 x 198 pixels when viewed full size. I am proud to announce the creation of a new web site at www.kelmscottfundraising.com for Kelmscott Copy & Consulting. Here I’ve used 19th century art by William Morris and his associates to illuminate this web site and give it a one of a kind theme. Kelmscott Manor was where Morris and Company turned out stunning design and publishing work. If your cause needs fund raising copy and consulting services, be sure to visit the new Kelmscott Copy & Consulting site. This site is implemented WordPress, enabling my client to add content easily. See my web services page for more information on how I can help your business get online with an attractive, useful site tailored to your needs and market.